Can Martinez get the best out of Naismith? It would be accurate to say that all Everton fans were in unison in their feelings about Steven Naismith on Saturday evening. Whether strolling out of Goodison Park, switching off the TV or Radio, there was a sense of good will towards the birthday boy who hasn’t always been the flavour of the Everton fan base. 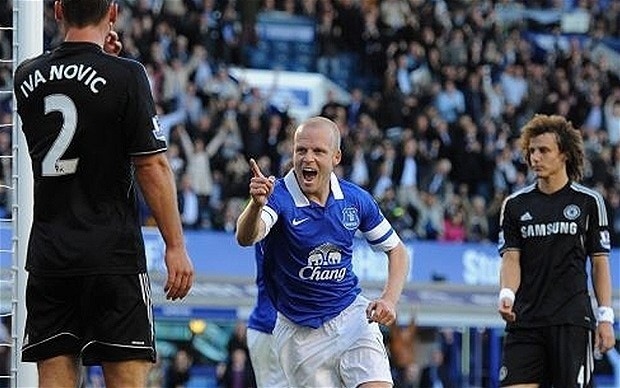 I hope this piece does not come across as a knee jerk reaction to Naismith getting the match winner, but I think this performance could be the springboard for him to kick on in his Everton career and I think that Roberto Martinez will be the key factor in all of this. Its early days into the reign of Roberto Martinez at Everton but he already seems to be displaying a knack for improving player’s confidence. The way he has spoken about Ross Barkley in the press so far this year suggest he has spent time putting an arm round the young prodigy and it is fair to say that it seems to have had an effect. Barkley has come on leaps and bounds over the four games so far and seems to be growing as a player each time he steps out onto the pitch. The idea of telling the boy to go out and play without fearing the punishment of any mistakes (lets cast our minds back to when he seemed to be banished to the reserves after a bad game against Blackburn two years ago) seems to be a key factor and now Martinez is taking a similar approach to Steven Naismith. “I want him to feel that he’s on the park enjoying his football and showing his quality because when he does that he’s a very effective footballer”. Hopefully Roberto can achieve this and when thinking about whether Martinez can get the best out of Naismith, it is worth considering the case of Shaun Maloney. It is easy to draw comparisons between the two players as both are diminutive figures who flourished in the SPL and initially found the Premier League tough going. Maloney in fact had an underwhelming period at Aston Villa in 2007/8 which led to him being shipped back to Scotland. It was only after joining Wigan and being under the stewardship of Martinez that Maloney began to shine in England. Although Maloney may be more of a cultured player, Naismith possesses the qualities that can help him be an effective player for Everton. Despite suffering an underwhelming campaign last year, there were glimpses of his ability to get himself into goal scoring positions and he managed to bag four goals, including one against Liverpool. But none of his goals came in any victories for Everton and at times the crowd seemed to get on his back. By his own admission Naismith felt he could vastly improve on last year saying to Sky Sports News. “I am up for the fight and I wouldn’t have come here if I wasn’t. I’m glad to be part of this squad and I hope to be able to contribute more”. Yet Naismith already seems sharper than last year and he did himself a lot of favours with a good showing against one of the best full backs in the League in Ashley Cole, which is no small feat. Also his work rate this season has impressed me and I think that in time his industrious attitude will win any fans over who doubt him. I think I speak for all Everton fans when I say I would love to see him really kick on this campaign. Although there were frustrating moments last season, this year presents a real opportunity and Roberto Martinez can be the man to revitalise his career. He has the chance to leave the memories of his cruciate ligament injuries and tough first season in the past and let’s hope there will be more match winning goals from Steven as the season goes on. Next Post Why don’t we utilise the bench?